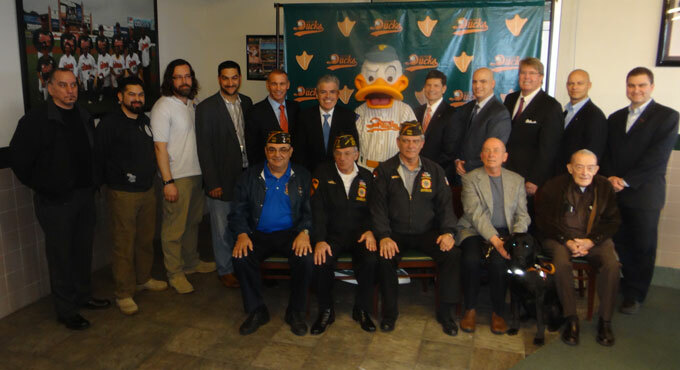 The three-time Atlantic League champion Long Island Ducks have teamed up this season with the Suffolk County Office of Veteran Affairs and New York Community Bank to present a brand new “Heroes of the Game” program. At Ducks home games, the team will publicly recognize local veterans and active duty service men and women. Two “Heroes of the Game” will be selected for each 2015 home game at Bethpage Ballpark. Each will be honored during a live, in-game tribute for their selfless and courageous service to our country. In addition, each hero will receive ten complimentary tickets to the game at which they will be honored, so that they may bring their family and friends along with them. Veterans and active duty personnel can register to be recognized as one of the “Heroes of the Game” by calling (631) 853-5020 or by sending an e-mail to scheroes@suffolkcountyny.gov. Suffolk County is home to 1.5 million people and boasts the largest veteran population in all of New York State. Nearly 100,000 United States veterans call Suffolk County their home.